The Travel Photography Essentials Package for Canon includes gear helpful in capturing all the great scenery experienced when hitting the road for a new locale. TheCanon EF 24-70mm f/2.8L USM II is a prime piece of optical performance for a professional standard zoom lens, while the Canon EF 50mm f/1.4 USM boasts a super-wide aperture and a fast, silent, and accurate autofocus motor, making these excellent choices for travel photography. 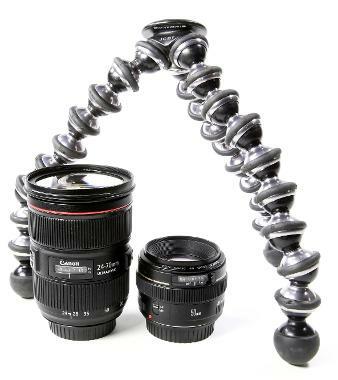 This package also comes with the Joby Gorillapod Heavy Duty Flexible Mini-Tripod an ultra-versatile mini-tripod or grip that can be used with large SLR cameras with zoom lens attached or with camcorders. Its three multi-segmented flexible legs can be formed to grip almost any protrusion.